Seema Abdul Razzaq Abdullah Al Abdul Hai Born in 1981. Qatif, Saudi Arabia Qualifications: •	Masters Degree in Internal Design, from the International Virtual University, U.K. in 2008. •	Graduated from King Faisal University in Dammam in 2004 (Internal Architectural Design). •	Vice president precedent of the Art group board in Qatif. •	A member of the Saudi fine art association. •	A member of fine art group in Dammam and Al Jouf and the Arabic handwriting group in Qatif. Personal exhibitions: •	(From over the shelves) exhibition at Social development center in Qatif and its second part at Atelier Jeddah in 2009. •	(Kharbshat Al Rooh) dual exhibition in Qatif in 2009. •	The Four exhibition in Desert designs in Al-Khobar in 2010. •	(Colours Shrine) exhibition in Vancouver-Canada-7 Second step in Al-Khober October 2012. Foreign participations: •	Infantellina Contemporary Exhibition in Berlin 2013. •	(Aroma Istanbul) International Painting Exhibition in Turkey 2013. •	15th Asian Biennale in Bangladesh 2012. •	Stamp 1 Exhibition in Bahrain 2012. •	The ministry of high education exhibition in Czech Republic in 2011. •	Saudi Cultural forum in Kuwait and Turkmenistan in 2011. •	4-Al khorafi International Biennale for Arab Contemporary Art 2010. •	The Saudi exhibition in Kazakhstan in 2010. •	Bahrain society for culture & art exhibition in Bahrain in 2009. •	Creativity and continuity forum in Morocco in 2009. Local participations: •	Limitied Edition 3 in Jeddah 2014. 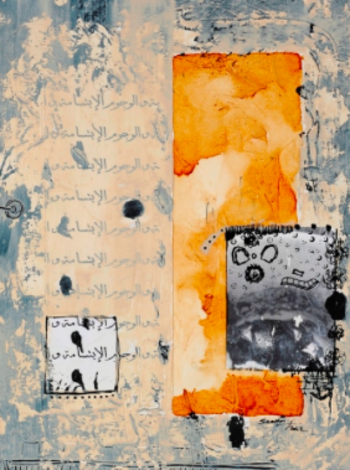 •	Mostly Visible exhibition organized by Athr Gallery & curated by Ashraf Fayadh in Jeddah 2013. •	Bashayer exhibition- The Sanad Association Chrity2011. •	exhibition (31st) in Dhahran 2010. •	Exhibition of Qatif's collective fine art group, number 11 in Qatif's club hall in 2010. •	Alqudus in the eyes of the artist exhibition in Riyadh and Alqudus exhibition in Al Madina Al Monawarra in 2009. •	Alssafeer (The third) art contest exhibition in the Ministry of Foreign Affairs in Riyadh in 2009. •	1362.45 km art exhibition at Atelier Jeddah in 2009. •	Collective's exhibition the second at the Arabic Heritage lounge in Al Khobar in 1429 H. •	Al Janadriyah exhibition at Riyadh museum in 1429H. •	Youth artists exhibition in Dammam 2009. •	(Kilak Faan) exhibition in Riyadh in 2008. Awards: •	Ninth prize award in the exhibition of female artists in Riyadh 2015. •	Acquisition award in International exhibition of Contemporary Islamic Art 2013. •	Jury award in the Youth exhibition and the collectibles exhibition, both in Riyadh in 2011& 1Gulf contemporary art festival 2013. •	Fourteenth prize award in the Ambassador exhibition in 2011. •	Fourth prize award in the exhibition of female artists in Riyadh 2009. •	Second prize award in, Youth exhibition the first, in Dammam 2009 & first prize 2012. •	Fifth prize award in Alqudes contest in 2009. •	Acquisition award in Alssafeer art contest in 2009& the exhibition market 2013. •	Tenth prize award in (Kilak Faan) contest in 2008. •	Youth exhibition award in 2003. •	Many other participations and certificates of gratitude.